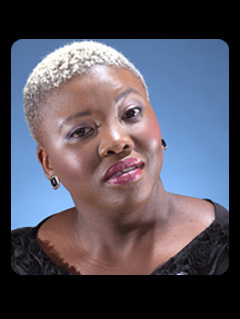 Celeste Ntuli, the queen of the Zulu comedy and the first ever local female comic to record a one woman show DVD called Seriously Celeste which is a collection of her performances across the country. A full-time stand-up comedian for the past five years, Celeste has come a long way since she was first discovered performing in a marquee in Durban about six years ago. The 33-year-old performer was born in Empangeni. After finishing high school she relocated to Durban to study entertainment technology at Durban University of Technology. Celeste attributes her success to the fact that she has no holy cows – stereotypes, relationships and social issues – no subject is taboo as far as she is concerned. Celeste had always been a joker, even at school, so it was no surprise when she decided to pursue comedy as a career instead. “I was always the class joker so when I saw a poster about a comedy show, I called the organizers and asked them to give me a chance to show what I could do,” she said. Celeste wants to make it on television next. “I see myself doing sitcoms in the near future.” Her fans and admirers have no doubt that Celeste will make the transition successfully.